We have a team of experts dedicated to finding the best deals for the most popular items on the web. Don't miss out. There are so many things to consider when shopping for baby bath tubs. 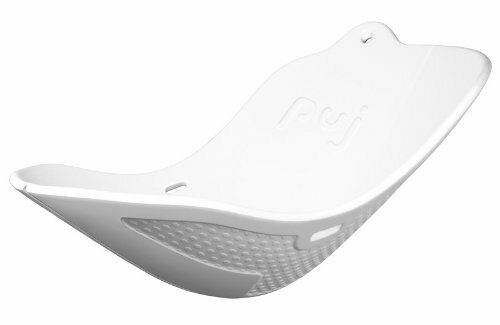 From the price, portability, comfort for the baby and you, design, and of course how safe it is for newborns. In addition, baby bath tubs today come in so many different variations that it's hard to really determine which is the best baby bathtub for your baby. So to help you with that problem, we are giving you a list of the 7 best in our opinion. ​Landing in the 7th place is Primo’s Euro-bath for its one of a kind anatomical shape with arm and leg safety support to keep the baby in a steady upright position. It has built in drain and 2 places to put the shampoo, soap and the bath sponge. The tub is also one of the biggest baby bath tub available in the market so it will give you more time before your baby outgrows the tub. It measures 36 L x 21 W x 10 H, can hold up to 38 quarts of water and with a maximum capacity of 50 Lbs so it is ideal for babies from 0 to 24 months old. The tub is easy to clean as it is made from polypropylene non-toxic plastic so it's also safe for the baby. You can also hang it on your bathroom door when not in use by just adding a plastic looped tie from the nearest hardware store in your house. It's available in 3 colors, pearl mint green, pearl white and transparent blue. ​This baby bathtub made it on our 6th spot because of its sleek and smart design. Boon is actually one of the leading brands for baby and infant products, driven to provide modern and unique products to make it easier for parents to take care of their babies. It is designed to make it very easy and simple for moms to recline, expand and drain the tub without losing any part so moms can give bath to their baby without the need of a second pair of hands to help. The recline position is ideal for newborns as it keeps the baby in bathing position and the head always above the water while the expanded feature can be used for infants and newborns. After use, you can quickly drain the water. It's simple, quick and stable. ​The Puj Flyte made it on our 5th spot because of its simplicity and portability. Not all baby bath tubs are this compact and easy to bring along whether in the back of the car or even inside the suitcase. It’s so small that bringing it along anywhere the baby goes is ideal. ​Setting up is easy as 123 because you literally just put it in the sink and it’s ready. Place the baby in the tub and it actually cradles your baby, keeping the baby safe and very comfortable. Travelling will always be easy now with this tub, no more kneeling, bending or backbreaking. The Sure Comfort Deluxe is a simple and one piece bathtub that extends from a newborn tub to a spacious toddler tub with a sling. 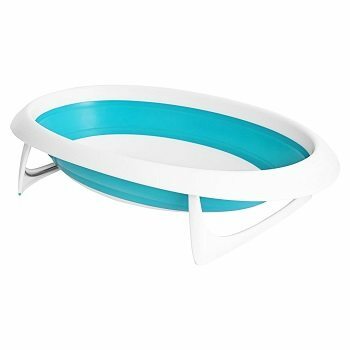 It has an integrated wash basin where you can place all the toys and baby soap and a drain plug for fast and easy draining of water which also changes color to let you know if the water is too hot for the baby to handle. It has been voted as the best bathtub in BabyCenter’s 2014 and 2015 Mom’s Picks which is also one of the reasons why this tub made it on our 4th place. BabyCenter Moms Picks are all based on polls and surveys conducted nationwide and does not endorse any company or product. Now this baby bath tub is unique from most bath tubs in the market today. 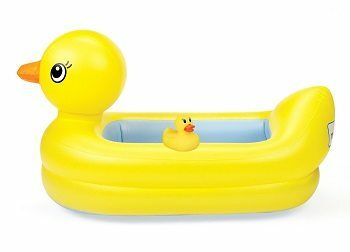 Aside from its rubber ducky design, it is literally an inflatable baby bath tub. 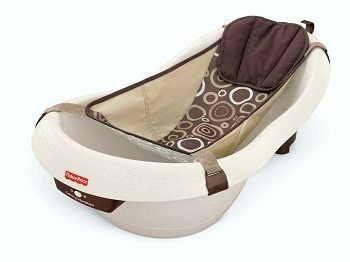 So yes it is also great for travel and its playful design make it easier for moms to keep the baby in the tub. However, it is recommended only to be used by 6 to 24-month-old children who are already able to properly sit without any help. ​Another impressive feature of this baby bath tub and which is the very reason it landed on the 3rd spot is its White Hot Technology that tells you when the water poured in it is too hot for the baby to handle. The 4Moms Infant Tub is another impressive baby bath tub that every mom should consider. 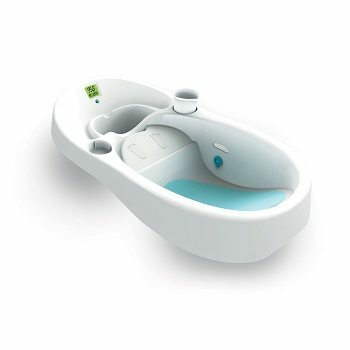 Not only is it modernly designed but also comes with very useful feature such as side drains to allow clean water to flow into the tub while the dirty water to flow out, comes with an internal digital thermometer that is color coded to quickly notify you if the water’s temperature is comfortable for the baby, includes an integrated rinse cup holder and designed with soap foams to avoid any bumps or bruises. ​It weighs 5.6 pounds with a 32.5 x 8.8 x 17.3 dimensions so it is perfect for babies up to 6 months and it fits most sinks. Display LCD is about 2 inches and uses 3 AAA battery that lasts for 8760 hours. Blue color pops out if the water is a bit too cold, green if it's just right and red if it’s too hot. 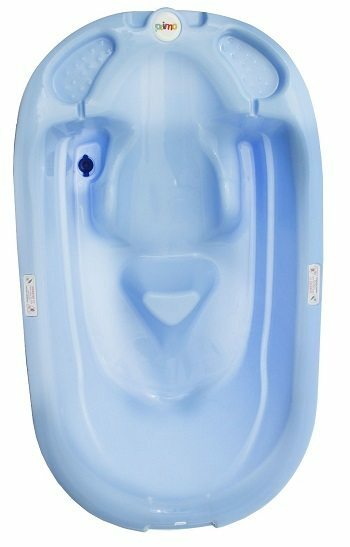 ​Your baby is literally like a boss with the Fisher-Price Calming Waters Vibration Bathing Tub as it comes with a relaxing and calming spa-like set up. 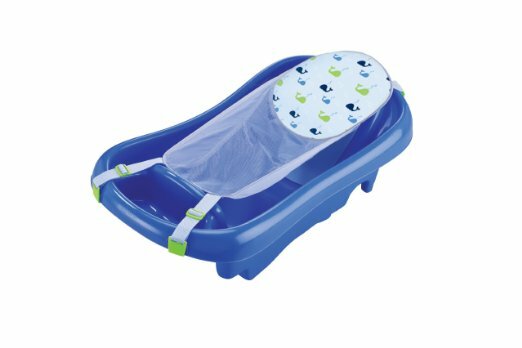 In addition, it is also designed with the grow-with-me stages wherein the tub can be adjusted depending on the baby’s size. For infants, use the fabric sling with a soft headrest to give the baby a sense of safety. When the baby starts to grow, replace the sling with the baby stopper as it places the baby in a comfortable reclined position to prevent the baby from slipping into the water. Then when the baby is able to sit and play by himself, remove the baby stopper so the tub will provide enough space for playing and bathing.